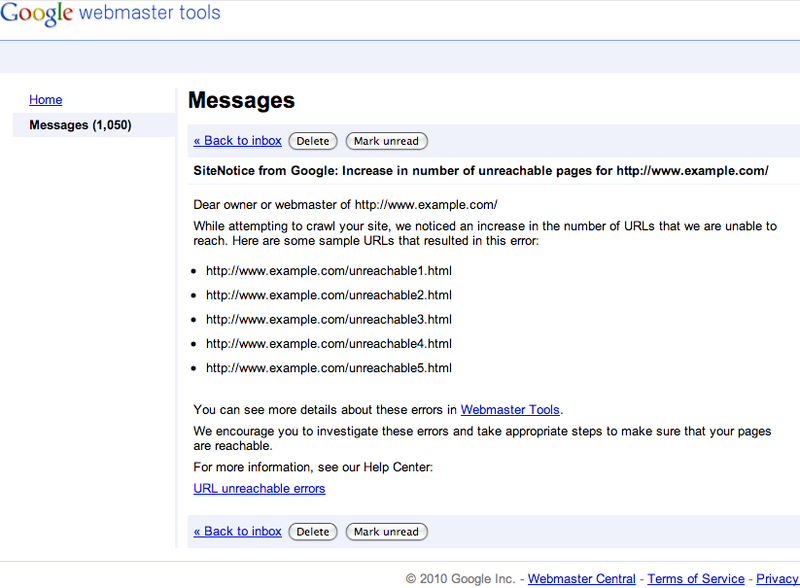 section of Webmaster Tools (even though it might be intentional and not actually an error). Continuing with our effort to provide useful and actionable information to webmasters, we're now sending SiteNotice messages when we detect a significant increase in the number of crawl errors impacting a specific site. These notifications are meant to alert you of potential crawl-related issues and provide a sample set of URLs for diagnosing and fixing them. We hope you find SiteNotices helpful for discovering and dealing with issues that, if left unattended, could negatively affect your crawl coverage. You’ll only receive these notifications if you’ve verified your site in Webmaster Tools and we detect significant changes to the number of crawl errors we encounter on your site. And if you don't want to miss out on any these important messages, you can use the email forwarding feature to receive these alerts in your inbox. If you have any questions, please post them in our Webmaster Help Forum or leave your comments below. When Googlebot crawls your site, it’s expected that most URLs will return a 200 response code, some a 404 response, some will be disallowed by robots.txt, etc. 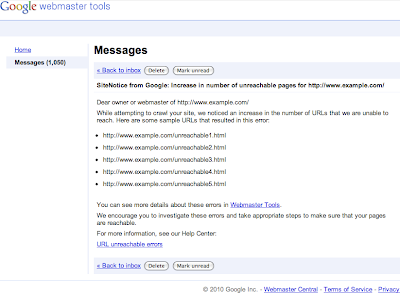 Whenever we’re unable to reach your content, we show this information in the Crawl errors section of Webmaster Tools (even though it might be intentional and not actually an error). Continuing with our effort to provide useful and actionable information to webmasters, we're now sending SiteNotice messages when we detect a significant increase in the number of crawl errors impacting a specific site. These notifications are meant to alert you of potential crawl-related issues and provide a sample set of URLs for diagnosing and fixing them. Also, last month we wrote about some best practices for getting video content indexed on Google. Today, to help beginners better understand the whys and hows of implementing a Video Sitemap, we added a starting page to the information on Video Sitemaps in the Webmaster Help Center. Please take a look and share your thoughts.